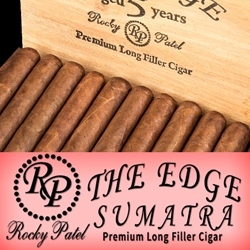 Released in 2007, the Edge Sumatra by Rocky Patel remains one of the top selling cigars on the market. These hand-rolled premium cigars offer a unique blend of Nicaraguan tobaccos infused perfectly inside a silky 5 year aged Ecuadoran Sumatra wrapper. Rocky Patel The Edge Sumatra is billed as a full-bodied cigar with notes of butter, coffee, black cherry, and a hefty dose of pepper spice. Named to Cigar Aficionado’s Top 25 Cigars with a 91 rating, the Edge Sumatra by Rocky Patel are handmade cigars that make an excellent choice for any cigar connoisseur. Smokers Discounts has made it easy and affordable to buy premium cigars online. A variety of sizes and flavors are listed below at our discount online cigar store. Each of these styles are in stock and available. Call us for more details!